With Fluorescence Correlation Spectroscopy (FCS), the correlation of the temporal fluctuation of a fluorophore is analyzed. The diffusion time and the concentration is detected. This leads to information about the size or shape of the molecules as well as the viscosity of the environment. 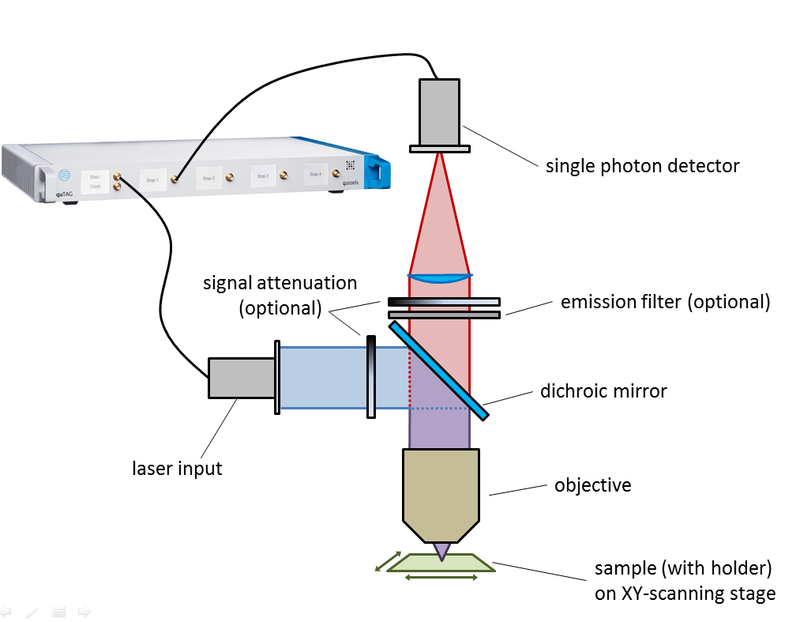 A typical setup contains of a high focussed laser illuminating the detection area, where the emission of a single fluorophore is detected using TCSPC. The emission is detected by a single photon detector and recorded with a time tagging device quTAU or quTAG. This data is then autocorrelated to obtain the desired information. General layout for fluorescence correlation sprectroscopy. The same aetup can be used for lifetime spectroscopy and -imaging. 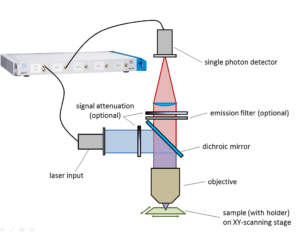 When the laser is pulsed, the same data can be used to determine the correlation and the lifetime, called fluorescence lifetime correlation spectroscopy. For this, a stop event relative to the pulse of the laser is analyzed for the lifetime and the same stop event relative to the start of the measurement is analyzed for the correlation. Both can be done easily with the quTAG.